Big bank lending to small businesses rebounded in November and resumed a positive trend that has lasted much of the year. This latest data from Biz2Credit’s Small Business Lending Index should be good news to any small business owner seeking more capital to expand or diversify their operations. According to the November 2014 Biz2Credit Small Business Lending Index, big banks approved 20.8 percent of the loan requests of small businesses nationwide. That number is up 0.4 percent over October’s rate. In October, the index reported a drop in small business loan approvals for the first time in seven months. The data shows that small business loans approval from big banks is generally increasing this year, suggesting an improving economy. Biz2Credit CEO Rohit Arora notes that big bank lending to small businesses is up 20 percent over last year. In a statement accompanying the November Small Business Lending Index report, Arora says big banks are committing to digitization and catering to more customers — in this case, small business owners — who want to conduct business via smartphones, tablets, and online. But as lending from big banks continues to improve, the same is not happening at small banks. 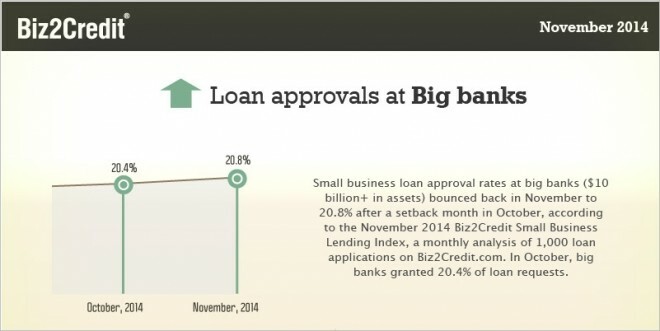 The Biz2Credit data shows that small banks approved less than half of the loan applications they received from small businesses in November. And this continues a negative trend. Loan approval rates at small banks hit 49.8 percent last month, down from 50.2 percent in October. It’s the sixth straight month of decline in this category. And for the first time in a year, small business loan requests were denied more often than granted. A negative trend continued among alternative lenders in November. Small business loan applications were approved 62 percent in November from 62.1 percent in October. That’s the tenth straight month of decline for loans from this sector, based on Biz2Credit data. Finally, small businesses continue to see support from institutional lenders. Biz2Credit has been tracking this data since the beginning of 2014 and in every month, the approval rate has increased. Last month, the rate reached 59.9 percent, up from 59.7 percent in October. The post Small Business Loans Bounce Back in November appeared first on Small Business Trends. Are you using Small Business Workbench ?